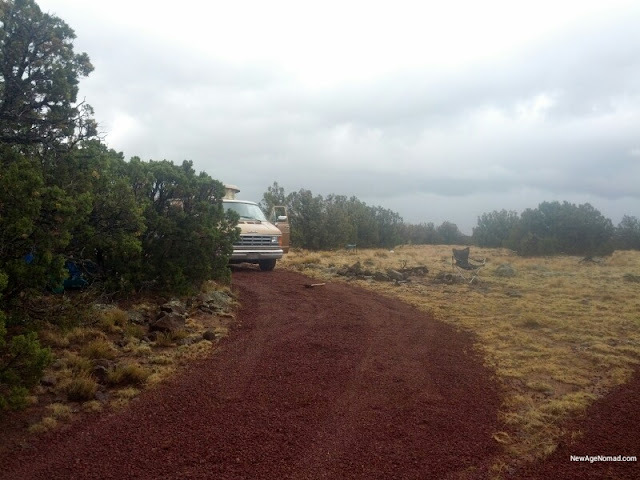 New Age Nomad: Driveway's in! Finally after 10 weeks of waiting, the Apache county court system has finally cleared the title on the land, so as of last Tuesday I am officially a landowner once again. Yep that mean gotta pay property taxes again, but $60 a year shouldn't put too much of a damper on things. However the purchase price of the land, and cost of the driveway will definitely cut into my gas travels for a bit. The day after signing the papers I had the driveway delivered. Pic above is the Turtle's new perch. Located behind some 12 ft junipers about 160 ft back on the property. Will post more pics later. There is still alot of work to do. Had 25 yards delivered, and the driveway only took about 10, so I will be spreading it to create a large parking area, walkways, and a campfire area. To bad all that work will be postponed until mid August, after 5 days. Candy once again decided the upper 80's were to hot, so we headed back up to 9500' for a few weeks. Although the land averages temps in the upper 40's at the coolest months, and upper 80's on the warmest months. Ill be frequenting it the most during the spring, and fall. Take Care, and Good Day! Very nice! Congratulations on an exciting investment! I'm so happy this finally happened for you. Congrats! Hoping to make it back up there by August. It isn't very comfy down here. Hugs to Candy from Fred.